Please join us this Sunday evening at 6 PM for a Farewell Reception at the church in honor of the Duncan Family. Come help us say goodbye and send well wishes to Kory, Sorrel and the kids as they embark on the next step in God’s plan for their lives. 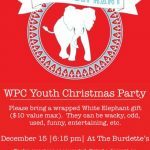 Details for the Annual Youth White Elephant Christmas party can be found here. Join us December 10 at 6pm for our annual choir Christmas presentation. “Breath of Heaven” explores the wonders of Christmas and will be enjoyed by the whole family. Presented by our sanctuary choir and instrumentalists, (plus a special appearance from our children) this is a night you do not want to miss!